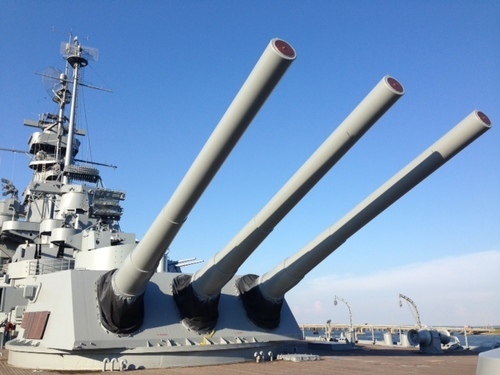 Explore the mighty WWII battleship USS ALABAMA, winner of nine battle stars, and the submarine USS DRUM. Both are National Historic Landmarks and are celebrating their 75th anniversary. Our aircraft pavilion is filled with over 25 historic planes and military vehicles including the Mach 3 A-12 Blackbird supersecret spy plane. In celebration of WWI, we have a new exhibit entitled The Great War. We also have a snack bar, gift shop, kennels for pets, picnic tables and fishing pier. 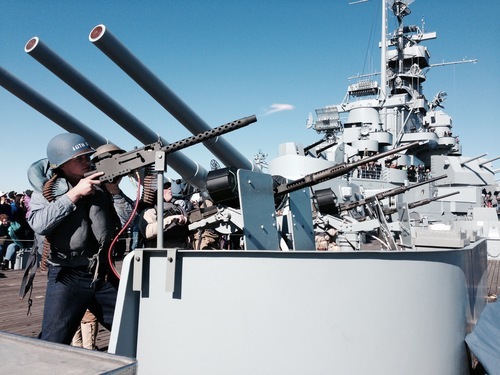 The 16 inch guns of the USS ALABAMA.